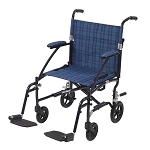 This Bariatric Steel Transport Chair by Drive Medical has dual, reinforced steel cross braces and a reinforced steel frame for added support can withstand a weight of 450 lbs. The heavy duty, nylon reinforced upholstery comes with a back carry pouch to easily and securely transport personal items. 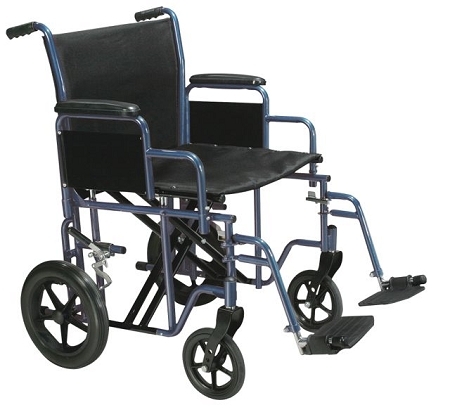 In an attractive blue, this chair comes standard with a roomy, comfortable 22" width seat. 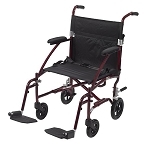 Actual Product Weight: 48 lbs; Armrest Length: 10"; Armrest to Floor Height: 27.5"; Back of Chair Height: 16"; Brakes: Push-To-Lock Wheel Brakes; Casters: 8"; Closed Width: 11.5"; Depth of Seat Upholstery: 18"; Folded Dimensions: 38" x 11.5" x 37"; Number of Wheels: 4; Overall Length w/ Riggings: 38"; Overall Product Height: 37"; Overall Product Length: 38"; Overall Product Width: 26.5"; Primary Product Color: Blue; Primary Product Material: Steel; Product Weight Capacity: 450 lbs; Rear Wheels: 12" x 1" Flat Free; Seat Width: 22"; Seat to Armrest Height: 8"; Seat to Floor Height: 19.5"; Wheelchair Weight Without Riggings: 45 lbs; Width Between Armrest Pads: 22.5"; Width Between Posts: 22.5"; Width of Seat Upholstery: 22"